Viking Vets - Memorials - Your local vet based at Chevening, Station Road, Henbury, Bristol BS10 7QQ. This section of the website is for clients to leave pet memorials. Well chosen words to remember our departed friends. If you would like to like to leave a memorial for your pet please email it to thevets@vikingvets.com. Many (MANY) years ago I went to Bristol Dogs Home on a whim. I was feeling very sad and down in the dumps. I had always loved dogs, and had looked after my sister’s border collie for a few months when she had gone traveling, but I had never had my own. I had absolutely no intention of adopting a dog when I went for this visit, but as I walked around the pens I spotted a beautiful tri-colour border collie. He was sitting quietly in his pen, and as I crouched by the gate he walked over, sat down, and then wiggled on his bottom so his fur poked through the bars and I could stroke him. It was love at first sight and 2 weeks later went to pick up BOB and off we went to our new life together. During those first years it was just me and Bob and we did everything together – rugby tour, football tour, holidays, and so on. After he had been with me for a couple of weeks, I went away to play in a rugby tournament. It was in June and was being run over a weekend. I was camping and decided that there was no way Bob was ever going to kennels, so he would just have to come with me. I will never forget the first night we camped. I only had a small tent, so I made up his bed in the outer tent. When I woke the next morning he was fast asleep where I had left him. I hooked him up to his lead and took him for a morning walk. As we went around, people started to shout things such as “there’s Bob!” or “hello Bob!” I asked how they knew his name, and was told he had gone for a wander round the site that night, stopping off at various camp fires and barbeques for a sausage!!! The following night was a bit more cramped in my little tent! From the day I had him I hardly ever had to put Bob on a lead. He walked perfectly to heel, and always came back when a called him. If you took him into a field of sheep, it was as though they were fluffy white clouds – he barely noticed them and seemed slightly confused as to why they were gathering together…..they knew he was a sheep dog of course! Seven years on, I met my partner Jo and we moved to a new house. He never batted an eye, and settled into his new life with 2 cats. Indeed, he soon realised he was onto a real winner. He had double the love (if that is possible!) and his new neighbours absolutely adored him….they had him to stay when we were at work, or chatted to him over the garden fence and pushed treats through for him. Bob was such a good boy so there was always a steady stream of people volunteering to take him for walks. His favourite game was ready, steady…….GO. He would sit waiting for the GO shaking with anticipation, before running as fast as his legs would carry him. I remember being out with him on our bikes once and I told him to GO. It was as though he had put his after burners on – his feet barely touched the ground as he barked and yelped with joy. His big party trick was “dancing”. His favourite tunes were “Hawaii 5-0 and “when the saints”. Every time you started singing those tunes he would jump and twirl and bark. The moment you stopped he would be stock stilltill you went again….it was like musical statues! He loved going to get his collar when it was time to go for a walk, and adored his time exploring Blaise Castle and Ashton Court. Of course there was the odd moment of naughtiness. If you left the door open to where the cats had their food, he would magically wake from his deep sleep and, given the opportunity, tip toe to the dishes, help himself, and make it back to his bed before we returned. His other more famous thefts include chocolate coins off the Christmas tree (how he unwrapped them I will never know! ), a bag of very posh coconut ice, a packet of Easter biscuits, and an ice cream (photographic evidence! )….he couldn’t believe his luck – eyes out on stalks – down in one gulp. When Bob was about 10, he jumped a style and caught his back leg on the top of it, and as he twisted to free himself he snapped the ligaments in his knee. I was distraught. We took him straight to the vet, and the next day he went off to have his operation. It wasn’t long before he was all healed up….he was never QUITE as speedy as before, but he still gave it a go. As Bob entered his old age, he eventually started to slow down, and enjoyed his sleep a lot more. He got arthritis in his back, but he never complained – he was so brave. For our annual leave this year we were meant to be going abroad in June but couldn’t bear the thought of a holiday without him. We had the most fantastic and special time together in Devon sitting in fields watching the sun go down, and lying on deserted beaches with him under his umbrella. I will treasure these special memories along with all the others that I have of our wonderful life together. Last week, Bob decided that he’d had enough and went to sleep for ever. My heart is completely broken. My gorgeous, gentle, kind, funny Bob the Dog….I will think of you running on the beaches, chasing balls, and dancing, somewhere beautiful. I miss you more than words can ever say. 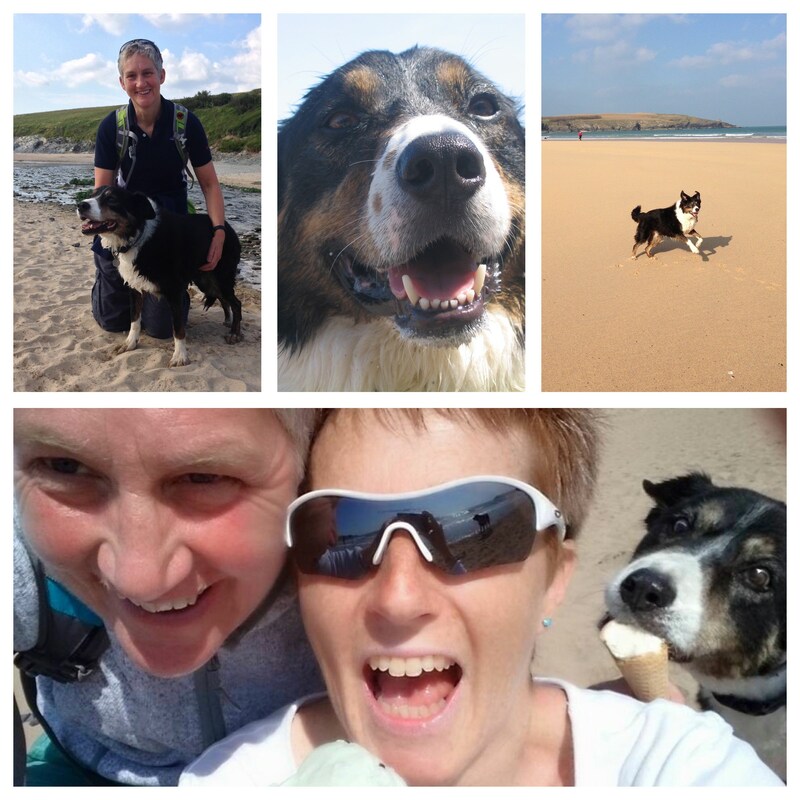 Goodbye my friend, my BESTEST boy ….ready, steady, GO! When it is too hard to look back, and you are too afraid to look ahead, look right beside you and I’ll be there. Miss you. 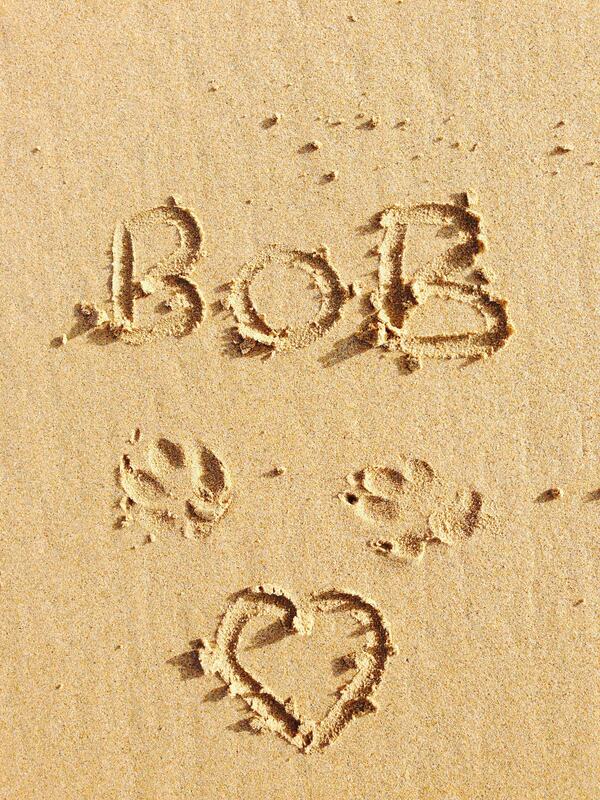 Love you my Bob XXXXX. When I first got Bob, I took him to Viking Vets and they have been so wonderful with him throughout his life. Unlike many animals, Bob LOVED going to the vets – he used to pull me up the path to the front door…..it might have had something to do with the special liver treats he used to get from Carolyn! I cannot even begin to express my gratitude to Bob’s favourite vet Vicki, and favourite nurses Lisa, Carolyn – indeed everyone at Viking Vets for the love they have shown to Bob over the years, and the love, kindness, and compassion they had for him during his last moments. These times are always unbelievably hard, but they helped so much and his passing was so beautiful and peaceful. Thank you. This photo was taken ten years ago, at the time we had three dogs. Being a vet, I have to help people make very difficult decisions, having been through this myself as a dog and cat owner mean that I understand the emotion we all are struggling with when it comes to making a decision to put a beloved pet to sleep. The Good a Chocolate Labrador, called Maddie which was the only dog we ever bought. We picked her up at eight weeks from a family breeder in Wales, we were living on a farm in the Cotswolds, and I was still at University. She was a great dog, she spent every day with Andrew on the farm. She was scavenger and had a very bad habit of eating afterbirths after the cows had calved, bearing in mind a calf weights as much as 50 kg the after birth is substantial, and you can’t stop half way. Andrew ended up having to pull it out of her mouth more than once. She joined us before we had children, and was very much a child replacement. When the children came a long she had some readjusting to do but managed very well. We moved to Bristol in 2000, and her life became less adventurous. No more rat catching, afterbirth and sheep poo eating, but she was getting older and happy to spend her time at Andrews’s feet in the office, or bossing the other dogs in the practice around. We had to put her to sleep when she was 13 years old, it was a Saturday afternoon, she had started to fit and we were unable to stop it. The boys were eight and nine years old, Maddie had been a presence in their entire life and they loved her very much. She had always been extremely patient and kind towards them even if the attention given to her had dropped a bit after they came along. We all huddled together around her, and felt a sense of relief as she passed away, and her tired body relaxed. The Bad was a young Irish Wolfhound, called Fern who due to changing family circumstances was looking for a new home. I thought it was going to be difficult to persuade Andrew to take on such a large dog, as it happened it turned out that Andrew had always wanted to have one. She was rather destructive in the early days, we later found out that she had more or less eaten the previous dog owner’s kitchen. She was very charming in her naughtiness, she would very much think about being obedient and generally decided not to listen. She was a picnic thief, and we had to apologise on more than one occasion when she was stealing food at Blaise. I am very fond of a Norwegian chees called Jarlsberg. I had put 1 kg on the side while I went to answer the phone, when I came back the cheese was gone, the dog was laying on the carpet in the same position as when I left. The next day I finally realised that it was not me going mad when I found some plastic in her poo. Giant breeds are not long lived, most do not get over ten years old. Ferns started to have mobility issues when she got to ten, we had her on join supplements and painkiller, but she started to find it a real struggle to go up and down the stairs. We live on the first floor so stairs was unavoidable, she started to refuse to come upstairs, and weighing 60 kg, we could not carry her. During her last months, she became very tired and fed up, it was a very gradual decline, which made the decision to put her to sleep very hard since each day was only marginally worse than the day before. When she could no longer get up on her own, we decided that it was best to let her go. Again it was a family huddle, many tears were shed, but we knew it was best for her. The Ugly was an obese British Bulldog, called George that needed a new home when he was four years old. He weighed 42 kg when he came to us, the previous owner had found it impossible to slim him. We were told he did not eat dog food, they were right for the first three days he ate nothing, then he realised that dog food, and the diet version was all he was going to get. Over the next 5 months his weight dropped to 28 kg and he became a very happy active Bulldog. My only previous contact with bulldogs was family holidays in Finland, where my uncle had a very grumpy and aggressive male called Gusti, he attacked my brother and me more than once. Having been a bit uncertain about the breed and already having two other dogs, he managed to charm us to his smelly, noisy ways. He was a very sociable dog, carpet time was very important for him, but he would sacrifice this to come and find us because it was more important for him to be with people rather than lie on a soft favourite carpet. He had an intense hatred towards traffic cones, and would try to kill them. He was very fond of me, and would always greet me at the bottom of the stairs in the morning. He developed a very malignant tumour of the jaw, we did try treatment but sadly it did not work for George and he was put to sleep in November 2014 , 11 years old. They say that if you ever get the perfect dog, you've hit gold. If that's the case we were minted and had change for a donar kebab and taxi home! Wilfred was a 25th birthday pressie , Alan , my husband, gave into my Mariah Carey emotional blackmail of throwing an engagement ring at him saying 'it's a dog or no engagement'. Alan toddled off to Exmoor after a tip off about an advert in shooting times and here was Wilfred, so called because my grandfather always called all his... grandchildren Wilf (saved learning our names). Wilfred ,with reflection, was like a child to us, I'm talking one step from Paris Hilton handbag stuff. Packing up his stuff today I realised we gave him the best of everything, In return we got this larger than life character who taught us about responsibility ,about unconditional love, patience (yes really) going to dog shows and always coming last as he would leg it past the judge when I called him and do a massive pooh, that took patience. Even in death he has taught me you can run but you can't hide , sometimes you just got to grow some balls. Today was very emotional and quite frankly like ripping a plaster off . Alan and I sat in the garden at 6am ,just with Wilfred, gutted that we had to say goodbye but knowing the only one thing he asked from us was dignity and to be set free. A lovely friend who I nick named Paul Mcartney (singing words of wisdom) said 'it's the circle of life'. That resonates to us as he left us as our family was completed. Wilfred died peacefully in our house, prior to his injection he rested his head on my arm and looked right into my eyes, it was what he wanted. He had a sausage and he was gone. Farewell my fella, I hope like my friend Gwena says, your in the big sausage shop in the sky. You're always been in our lives and thanks for all those happy memories. RIP Wilfred 13th May 2001 - 2nd May 2014. We would like to thank Maria and all the nurses and vets who have provided Wilfred with such amazing care over the years. Dear Maria, Thank you So much for the lovely card that you sent. It really meant a lot. Also, thank you for making Gabriel’s last moments so gentle and peaceful. It helped us a lot to come to terms with it. Being able to say goodbye to him in your garden was lovely and we are very grateful to you for giving us that opportunity. The sunny garden definitely helped relax him. I will always remember seeing his eyes closing peacefully. He was a very special dog to us. He was a really lovely, sweet natured little puppy. He was a brilliant fun loving young dog that did everything with gusto. He had a great sense of humour and frequently had us in stitches. He got up to mischief. He once went up to a disabled child in a wheel chair and stole his sandwich. Luckily the people involved were very understanding. He was also a very sensitive and loving dog who always had time for a cuddle especially if my Sister or I felt ill. It was a privilege to know him and spend time with him. It was ultimately a privilege to be with him as he passed away. Thank you Maria. Thank you so much for making his Vet visits so positive. Before we came to your practice, our previous Vet was not as popular with our dogs and there was a lot of kerfuffle and anxiety experienced. It all changed when we came to you. You have a lovely calming way with dogs. All your staff have been lovely through the years to all of our dogs, but I think Gabriel had a soft spot for you in particular.